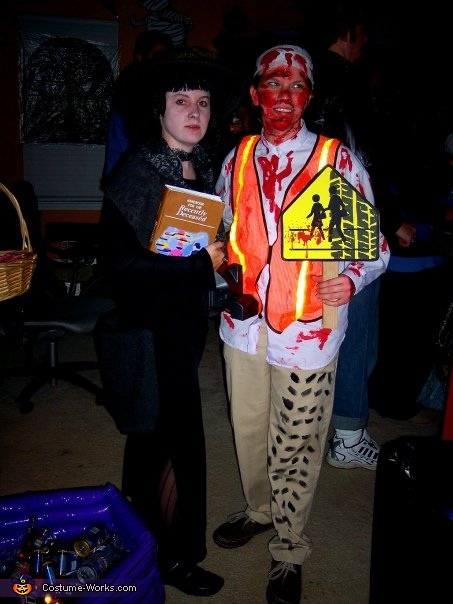 I'm not sure where I got the idea to be a school crossing guard victim, other than the fact that I love Halloween makeup and generally revolve my costume idea around whatever makeup I that find interesting. I created the sign in Adobe Illustrator, went to Goodwill for the outfit and used black paint and a paint brush for the tire marks on the pants. The vest came from my brother who owns a construction company. Lastly I wrapped my head in bandages and applied blood makeup all over my face and clothing.